Apple is planning to install a 3D scanning system similar to Face ID on the rear of future iPhones, to help offer much-improved augmented reality experiences and better photography. While this feature is intended for iPhones launching in 2020, the upcoming 2019 models due this fall will gain a third rear camera, plus a USB-C port instead of Lightning, and a revamped iOS operating system. FaceID mini review: Better than Touch ID, or a step in the wrong direction? These are the claims of sources speaking anonymously to Bloomberg, which has a strong track record for Apple news. It is claimed that the iPhones due out in late-2020 will use a system similar to Face ID, but which projects infrared dots a far greater distance from the rear of the phone. The dot projector system would help the phone's camera gauge the distance and dimensions of objects the user points it at. Until now, smartphones have used software to work this out, but with varying degrees of success. Using a dot projector could give the iPhone much-improved portrait photography abilities, as for now the phone relies on software to identify the subject of the photo and neatly blur the background. Google's AI-powered Pixel 3 does a much better job of this, so it's understandable that Apple is looking for an alternative approach with technology borrowed from Face ID. It is claims the system would also help make for improved augmented reality experiences, as the iPhone would have a better understanding of the environment it is pointed at. This would help the phone place virtual items more accurately on real-world objects, such as the characters of a video game on a nearby table. Bloomberg's sources also claim the 2019 iPhone, due around September, will gain a third rear camera, an improved Face ID sensor, and will switch from Lightning to USB-C, as we saw with the iPad Pro in 2018. 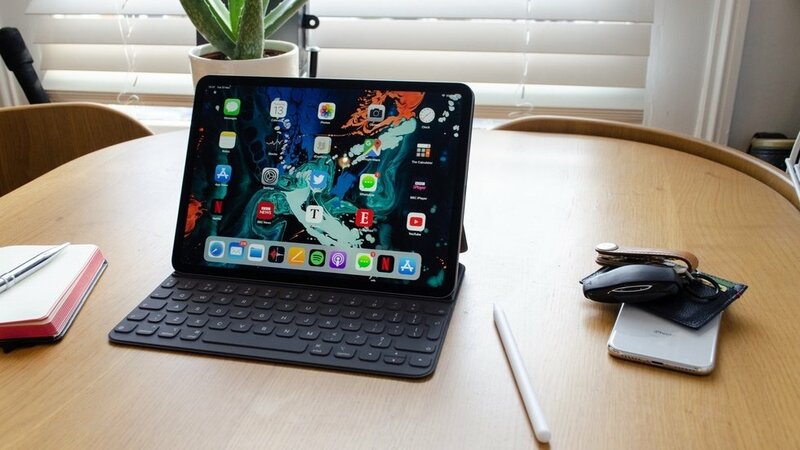 Speaking of the iPad range, the sources also claim 2019 could see updates to the regular iPad and the ageing iPad mini, plus new iOS features including a dark mode - as seen on macOS Mojave in 2018 - and, finally, an updated home screen and file management system for the iPad. This final point will be of particular interest to owners of the iPad Pro, which has the power of a high-end laptop, yet - as we found in our review - is held back by its smartphone-based operating system. A new home screen and file management system would finally turn the iPad (and especially the iPad Pro, with its extra power and keyboard dock) into the laptop-replacement Apple always wanted it to be. As always, we should point out that rumors of future products and features do not always turn into reality. We will find out for sure at Apple's next iPhone launch event, which isn't expected until September this year.